"After these things Paul departed from Athens, and came to Corinth." 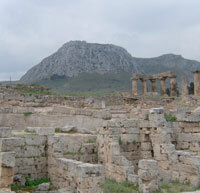 Corinth – the imposing Roman capital of Greece and centre of a vibrant pagan culture. The city was refounded as a Roman colony by Julius Caesar – Colonia laus Iulia Corinthiensis – after a century of near desolation which followed the retribution of another Roman general, Leucius Mummius. The narrow neck of land that controlled entrance to the Peloponnese, a massive natural citadel, the Acrocorinth, and two ports controlling east-west trade ensured the strategic importance of Corinth for centuries. The spectacular Peirene fountain, fed by springs, was the major source of water in Roman Corinth. Here a wide colonnaded street, lined with shops, terminated the road from the port area of Lechaeum. In some wild speculations the Christian meeting house is said to have been "somewhere near". Corinthian Order – an acanthus plant entwined around a votive basket atop a fluted column. The ancient exuberance came into its own during the early imperial period and never equalled in the degenerate Christian age that followed. The verb to ornament derives from the river Orneae which flows past Corinth. The pottery and ceramics of Corinth were exported all over the eastern Mediterranean. "Tiberius Claudius Caesar Augustus Germanicus, pontifex maximus, holding the tribunician power, proclaims: . . .Therefore it is right that also the Jews, who are in all the world under us, shall maintain their ancestral customs without hindrance and to them I now also command to use this my kindness rather reasonably and not to despise the religious rites of the other nations, but to observe their own laws." Not ornate. A crudely inscribed lintel found in secondary use near the Peirene fountain (and probably 4th century in origin) was misidentified in the late 19th century as evidence of "Paul's synagogue". The few Greek letters are optimistically interpreted as an abbreviation of "synagogue of the Hebrews". And if the lintel suggests a synagogue then Paul's "first church" must have been next door, right there on Main Street, Corinth. "At the marble steps of the Propylaeum the excavators found a heavy stone lintel on which they were able to decipher the words "Hebrew Synagogue", clearly cut out in Greek letters. The house in which Paul proclaimed the new doctrine must have stood beyond the colonnade in the region of Lechaeum street." – W. Keller, The Bible as History, p368. One of Paul's concerns was that Christians of "sure" faith would set a bad example to waverers by eating food offered to idols. Paul uses the word macellum in 1 Corinthians 10.25, meaning "meat market", which has led some apologists to posit that the word is evidence of the epistle's historical fidelity. "Eat anything sold in the meat market without raising questions of conscience." 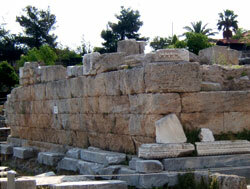 In fact, the macellum at Corinth has possibly been identified by an inscription found in the 1930s. But the find has no evidential value for Paul's presence in Corinth – every Roman town had a meat market! Roman Corinth was a bustling city of merchants and mariners and attracted wealth and whores to a prodigious degree. Reputedly a "thousand" sacred prostitutes serviced the sanctuary of Aphrodite perched on top of the 1,800 feet high Acrocorinth. But a four-mile climb to the summit at least suggests that most of the more profane ardour took place in the town below. "Aphrodite, as she was worshipped at Corinth, was none other than 'Ashtoreth, the abomination of the Sidonians', and was imported along with the Tyrian purple from Phoenicia." – J. Stobart, The Glory that was Greece, p103. "The temple of Aphrodite was so rich that it owned more than a thousand temple slaves, courtesans, whom both men and women had dedicated to the goddess. Therefore it was also on account of these women that the city was crowded with people and grew rich; for instance, the ship captains freely squandered their money." Aquila and Priscilla not only perambulated around the great cities of the Mediterranean at will but found time to instruct "a certain Jew named Apollos ... mighty in the Scriptures" so that he could in Achaia "powerfully confute the Jews." It also means Aquila and Priscilla left Corinth to evangelize in Ephesus – and Apollos left Ephesus to evangelize in Corinth. Hmm. "In Lechaeum are a sanctuary and a bronze image of Poseidon." – Pausanius, 2.2.3. Lechaeum, on the Corinthian gulf, reputedly the third largest port in the empire, was equipped with shipyards and a naval station. Here also stood a giant Christian basilica dedicated to St Leonidas – but that was no earlier than the 6th century. 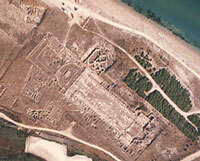 Remains of the massive Christian basilica at the port of Lechaeum. "In Cenchreae are a temple and a stone statue of Aphrodite, after it on the mole running into the sea a bronze image of Poseidon, and at the other end of the harbour sanctuaries of Asclepius and of Isis. Right opposite Cenchreae is Helen's Bath. It is a large stream of salt, tepid water, flowing from a rock into the sea." 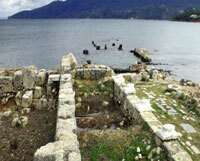 Cenchreae (Kenchreai) on the Saronic Gulf received the riches of the east on its way to Rome. A traveller bound for Piraeus or Ephesus would have embarked from here. There is evidence of a Christian basilica – but no earlier than the 4th century. "Fountains were among the most evocative symbols of Roman Corinth.The fountains of Peirene and Glauke were complemented visually and symbolically by a plethora of other water displays, ranging from modest basins and water-spouting nymphs to an impressive fountain of Neptune-Poseidon, the jewel-like South Stoa fountain, and a grand nymphaeum built in the shadow of Temple Hill." – B. Robinson, "Fountains and the Culture of Water at Roman Corinth", 2001. Hundreds of life size terra-cotta body parts have been recovered from ancient Corinth, votive offerings to the god Asclepius. In the New Testament yarn Paul visited Corinth on his second missionary journey, stayed eighteen months and founded the Corinthian church. He supposedly returned to Greece – one assumes to the city of Corinth – for three months on his third mission. Two letters ostensibly written to the Christians of Corinth form part of the core of "authentic" Pauline epistles and shore up the historical claims of Christianity. In Corinth, above all places on the apostle's various itineraries, defenders of the faith muster "historical markers" to corroborate the instructional tale of early evangelism and nascent discord in the Church of God. Yet if we are not blinded by the conviction that the Corinthian episode is an obvious truth requiring no examination of the evidence, we can recognize the high probability that the apostle's residence in the city is entirely a matter of fable, and that the true authorship of the Corinthian epistles is rather more problematic than is generally supposed. "The church at Corinth clearly got off to a flying start ... These conversions happened so quickly that they must be understood to have been the result of a carefully thought-out strategy." – Murphy O'Connor, Paul, His Story, p86. "And when they blasphemed, he shook his raiment, and said, Your blood be upon your own heads." – Acts 18.6. An unknown Jewish religious emissary arrives in a large and bustling Roman port city. By happenstance he encounters fellow Jews who share his trade, can employ his skills and also offer him accommodation. Our emissary is a sectarian of a novel and miniscule faction within Judaism and – glory be! – it emerges so too are his new friends and employers. Unwelcome in the synagogue where he tries to win converts, he is able to set-up shop next door because an early neophyte happens to live "hard to" the synagogue. The vociferous Jews of the city reject his message – all that is, except the very leader of the synagogue and it would seem the man who replaces him. Our charmed preacher escapes arraignment before the provincial governor and continues his mission. His success is not confined to wealthy Jews. The pagan city treasurer is also won over, even running errands for our proselytizer to far off cities. A thriving church is established and our bold evangelist moves on with his "good news" to pastures new. The concatenation of fortuitous events beggars belief. And yet such are the claims made for Paul of Tarsus, apostle to the Gentiles, in the city of Corinth. "Now after Corinth had remained deserted for a long time, it was restored again, because of its favorable position, by the deified Caesar, who colonized it with people that belonged for the most part to the freedmen class." – Strabo, Geography, 8.6.23. c.23 AD. "Corinth is no longer inhabited by any of the old Corinthians, but by colonists sent out by the Romans." – Pausanias, Periegesis Hellados, 2.1.2., c.150 AD. Corinth at the time of Paul was not a Greek city but a Roman colony and only scant traces of the earlier Greek city have ever been found. Strabo, an early 1st century AD historian and geographer, records the desolation of ancient Corinth at the hand of the Roman general Leucius Mummius. The year was 146 BC. The Corinthians had unwisely rallied resistance to their Roman overlords and the city had suffered the ultimate penalty. But the site had natural advantages not lost on Julius Caesar. After the defeat of Pompey at Pharsalus he chose Corinth to settle his veterans. 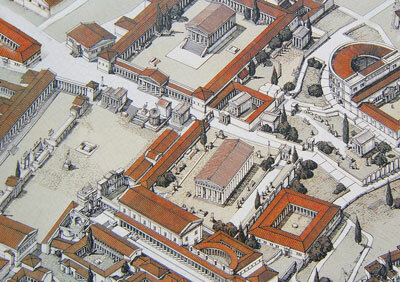 In 44 BC imperial architects laid out a grid of streets centered on the still extant archaic temple of Apollo. Caesar's heir Octavian was also obliged to fight civil wars on Greek territory, first against the assassins of Caesar and then against Antony. With the triumph at Actium, Octavian turned his attention to his newly acquired eastern provinces where he settled large numbers of veterans. In 27 BC the southern regions of Greece were detached from Macedonia and reorganized as the province of Achaia. As part of the Romanisation process smaller towns were abandoned and their populations concentrated into strategically placed cities. 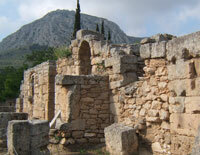 Corinth was one of these centres and the obvious choice for capital of Achaia. 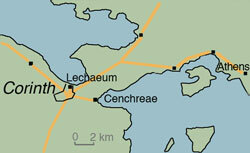 The city superintended movement between the Peloponnese and Attica and possessed two key ports, Lechaeum and Cenchreae, which controlled sea traffic between Rome and its eastern empire. The short, overland portage across the isthmus cut the sea voyage by more than two hundred miles. An added attraction of the city, drawing thousands of visitors biennially, were the Isthmian Games, hosted by Corinth. Nero himself attended the games in 66 AD. The new capital grew rapidly, peaking at more than half a million inhabitants in the late second century. In the mid-1st century its population was perhaps half that, a melee of state officials, military veterans, traders and mariners from east and west, hucksters, prostitutes and religious charlatans of every stripe. All were drawn by the growing wealth of this Roman boom town. Were there Jews in Corinth? Was there a synagogue? Pausanius, a 2nd century visitor, describes a Corinthian market-place replete with statues of Artemis, Dionysus, Poseidon, Apollo, Aphrodite and Athena. He names the temples of Tyche, Hermes, and Zeus and a sanctuary of "All the Gods". Above the monumental gateway leading from the forum to the port of Lechaeum he describes the gilded chariots of the sun god Helios and his son Phaeton, and the nearby bronzes of Hercules and Hermes. By the theatre, he records the sanctuary of Zeus Capitolinus and nearby a temple dedicated to Asclepius. By the Acrocorinth he notes dual sanctuaries of the Egyptian gods Isis and Serapis, and still further shrines of the Fates, Demeter, and Hera Bunaea. On the summit of the Acrocorinth, he records the famed Temple of Aphrodite. Yet Pausanius, in all this punctilious catalogue of piety, neither mentions nor so much as hints at either a "Christian meeting house" or a synagogue of the Jews. And this is in the mid-2nd century when the "Church of Corinth" should have been very much a going concern. This suggests that the Christians of the time of Pausanius were so utterly marginal as to go unnoticed and that the Jews of Corinth were either thoroughly Hellenized and honoured the gods of Greece and Rome, or so totally impoverished as to be unable to support a synagogue. After all, Jews of a later period, for example, in 4th century Rome, built splendid synagogues. The discovery of a crudely etched lintel from the 5th century, purportedly identifying the "synagogue of the Hebrews" but in secondary use, suggests orthodox Jews even at that late date were not a wealthy community. On the other hand, centuries earlier, it had been highly Hellenized Jews that had fled from Palestine after the Maccabean revolt, and these emigres had establishing enclaves in the coastal cities of Asia Minor and the Aegean (a point noted in 1 Maccabees 15.23). Attracted to the sophistication of Romano-Greek culture they had assimilated and became Greeks. But there could have been no such Jewish community in Corinth. Throughout the Hasmonean era – thanks to Leucius Mummius – the city had remained a ruin. Interesting evidence of an early Jewish presence in a Greco-Roman city has been found at Hierapolis in Roman Asia. Of 360 grave inscriptions identified, 23 have epitaphs indicating the interment of Jews (about 6 per cent). None are earlier than the second half of the 2nd century through to the 4th century. All the graves show signs of acculturation to Greco-Roman norms. The sole reference to a synagogue is a 3rd or 4th century inscription; earlier epitaphs refer to either trade guilds or the civic archives. The probability, therefore, of a mid-1st century Jewish proselytizer finding an established community of synagogue-going Jews in Corinth and then successfully pitching a novel message against both his ancestral faith and the officially-sponsored pagan cults in the city is not great. Is it possible that the bold evangelist – or at least the writer of the so-called letters to the Corinthians – never strolled into Corinth at all? "On the forum, where most of the sanctuaries are, stand Artemis surnamed Ephesian and wooden images of Dionysus, which are covered with gold with the exception of their faces; these are ornamented with red paint. They are called Lysius and Baccheus." – Pausanius, Periegesis Hellados, 2.2.5. Centre top: Temple of Octavia (sister to Augustus). West side of forum: Temples of Tyche, Klarios Apollo, Herakleos, Poseidon, Hermes. On north-south thoroughfare: Temple of Hera. But no church – and no synagogue – though a fanciful Christian "tradition" promotes the notion that a Christian meeting house was "near the Peirene fountain" (lower left). "In Achaia Nero attempted to cut through the Isthmus and called together the praetorians and urged them to begin the work; then at a signal given on a trumpet he was first to break ground with a mattock and to carry off a basketful of earth upon his shoulders." "On the tour through Greece, among the companions of Nero, Vespasian bitterly offended the emperor by either going out often while Nero was singing, or falling asleep, if he remained. Being in consequence banished, not only from intimacy with the emperor but even with his public receptions, he withdrew to a little out‑of-the‑way town, until a province and an army were offered him while he was in hiding and in fear of his life." "After this fight was over, Vespasian sat upon his tribunal at Taricheae ... Out of the young men he chose six thousand of the strongest, and sent them to Nero, to dig through the Isthmus." In the summer of 67 AD Vespasian gathered his legions at Scythopolis and advanced on the Jewish rebel stronghold of Tiberias. Anxious civic leaders quickly capitulated and the rebels – led by Jesus ben Shaphat – fell back to Tarichaeae, further north. When Tarichaeae was itself on the point of being overwhelmed the rebels improvised a fleet and took temporary refuge on the Sea of Galilee. But the Romans were not to be thwarted. Hastily assembling a navy themselves they engaged the rebels in a sea battle and several thousand Jews perished. As the dust settled, twelve hundred "old and useless" captives were executed in the stadium at Tiberias and above thirty thousand auctioned as slaves. But 6000 of the more robust rebels Vespasian boarded onto prison ships and sent to Nero in Greece for his latest megalomania – digging through the Isthmus of Corinth. It was a prudent offering to an unpredictable emperor. Although given command of the army in Judaea, Vespasian was still under a cloud at the imperial court. His failure to have shown sufficient enthusiasm for Nero's theatrical performances could yet prove fatal. It is thus clear that by late 67 AD a considerable number of Jews – mainly Galileans – were toiling away in Corinth. Early the following year opposition to Nero broke into open revolt and by June the emperor was dead. His successor Galba had no interest in continuing the canal project and there can be little doubt that what remained of the Jewish work force was sold to local slave owners. Many Jews must have been deployed dragging ships or their cargoes across the isthmus (along the diolkos slipway) or at the twin ports of Lechaeum and Cenchreae. These enslaved Jews and their offspring would be the natural constituency for a revisionist variant of Judaism called Christianity which developed in Greece over the following half century. In any event, despite claims to the contrary, archaeological evidence of Jews at Corinth early in the 1st century is non-existent. "And he found a certain Jew named Aquila, a man of Pontus by race, lately come from Italy, with his wife Priscilla, because Claudius had commanded all the Jews to depart from Rome: and he came unto them; and because he was of the same trade, he abode with them, and they wrought; for by their trade they were tentmakers." Christian Apologists love the reference made by Suetonius to the expulsion of Jews from Rome. The brief comment gels conveniently with the yarn in Acts that a Jewish couple, "lately come from Italy", were in Corinth to find and employ Paul. Implicitly these emigres are also Christians and certainly in a trice they become stalwarts of Paul's new church. One is agog to know what constituted pre-gospel, pre-Pauline Christianity – a vague rumour of a dead man seen after death? It presupposes credulity of gargantuan proportions. "As the Jews were making constant disturbances at the instigation of one Chrestus, he expelled them from Rome." – Dio, Roman History, 60.6. However, the most detailed report of this period is found in Josephus and yet there is nothing to be found in Josephus of this expulsion of the Jews, although he does agree fully with Suetonius on the expulsion of Jews twenty years earlier by Tiberius, along with the Egyptian cults and astrologers (Suetonius, Tiberius 36; Josephus, Antiquities, 18.3.5.). Josephus provides clues as to what may really have happened. The truth probably harks back to the events of 41 AD when Herod Agrippa was instrumental in securing Claudius his throne. Agrippa's reward was to be confirmed king of the Jews that same year. In all probability, Jews in Rome, incensed by the appointment of a Herodian, staged noisy protests – and indeed we know further agitations greeted Agrippa in Alexandria on his journey home. In 41 AD Claudius promulgated a decree confirming, not restricting, Jewish rights: "The Jews, who are in all the world under us, shall maintain their ancestral customs without hindrance" – a decree extant in several inscriptions. Josephus even reports that Agrippa "anointed his head with ointment" (hence "chrestos") when he met the senate (Antiquities, 19.4.1) – a reference that may well have inspired a later Christian scribe to interpolate the nonsensical "Chrestus agitation". Even if, despite the preponderance of evidence, we favour Suetonius' "one line" report over Dio Cassius and Josephus, the date of the "expulsion" is unclear. Suetonius writes thematically rather than chronologically and guesses vary from 45 to 52 AD. In any event, the inference that Claudius' decree banishing Jews from Rome caused an influx of Jews into Corinth is unmerited: expulsion from Rome was not expulsion from Italy. Suetonius in the preceding section of his biography actually reports that Romans wishing to travel abroad now required the emperor's personal approval. Tacitus in his Annals of Imperial Rome gives a highly detailed history of the reign of Claudius. This might have confirmed – or contradicted – the reference made in Acts to an expulsion of the Jews from Rome by Claudius which is so crucial to the story of Paul in Corinth. Unfortunately, the first six years of Tacitus' Claudian history (41 - 47 AD) are – as they say – "lost". Curious, eh? The 18-month sojourn of Paul in Corinth is the climax of his entire missionary crusade. Here, more than anywhere else, he achieves several impressive conversions and leaves a community which, if riven by a plethora of factional disputes, merits two major epistles which will ever after guide the entire Church. But we have a less than convincing explanation for Paul's remarkable success in Corinth – the one he tells us himself: magic. "I came to you, came not with excellency of speech or of wisdom ... not with enticing words of man's wisdom, but in demonstration of the Spirit and of power." "In nothing am I behind the very chiefest apostles, though I be nothing. Truly the signs of an apostle were wrought among you in all patience, in signs, and wonders, and mighty deeds." Curiously, the yarn in Acts has no "mighty deeds" to report other than the instant conversions themselves – no blinding of rival magicians as at Paphos, no raising of the dead as at Troas, no exorcism of spirits or highly localized earthquakes as at Philippi – perhaps the author of Acts was running out of ideas? Paul tells us the "first fruit of Achaia" is Stephanas who (alarmingly?) "have addicted themselves to the ministry of the saints" (1 Corinthians 16.15). Apparently, Stephanas, together with Fortunatus and Achaicus, has supplied Paul with "that which was lacking." In the mythology of Acts it is Crispus, "the ruler of the synagogue" (archisynagogos) no less, who hears Paul and immediately embraces the new faith – together of course with his entire family. The conversion is spectacular and wholly unconvincing, particularly as the rest of the Jews move "as one accord" in hostility to Paul. Another quick convert is Titus Justus, evidently already a god-fearer, and this fellow even offers his home to Paul, enabling the apostle to set up his mission slap next door to the synagogue in the centre of town. Dream on. Apparently, the successor to Crispus as leader of the synagogue is Sosthenes, who botches the "trial" of Paul so badly that the crowd turn against him and beat him up in front of the tribunal. Interestingly, the beating might have had a beneficial effect, because Paul introduces his first letter to the church at Corinth with: “Paul, an apostle of Christ, and Sosthenes, our brother.” (1 Corinthians 1.1.). Two successive rulers of the synagogue converted to Christianity? 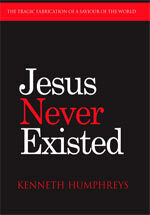 – only in a Christian fantasy land. Did Paul beam at the bema? "But when Gallio was proconsul of Achaia, the Jews with one accord rose up against Paul and brought him before the judgment-seat, saying, This man persuades men to worship God contrary to the law." Recent generations of Christians have revered a jumble of bricks and an associated wall called the "bema" as the spot where the proconsul Gallio acquitted Paul of accusations brought by the Jews of Corinth that he was preaching Christianity. Doubtless the event, complete with scuffles, is very vivid in the Christian mind but as history it is completely bogus. The centre of Corinth honoured the imperial dignity. Gracing the main forum on the east side stood the Julian Basilica, housing statues of Augustus and his successors and a tribunal. The building functioned both as an imperial lararium (sanctuary) and as a court in matters that required imperial arbitration. To the west, on an elevation looking down on the forum, stood a temple named for Octavia, the sister of Augustus. In the forum itself stood a monumental statue dedicated to the divine Augustus erected by the Augustales, priests of the imperial cult. Facing the forum from the south were an extensive number of official buildings including the Bouleuterion, the senate house of Corinth. Decisions effecting the city – which had two ruling officials, the duoviri – would be made here and proclaimed to the citizens from the rostrum (the so-called "judgement seat" or bema) outside. Plutarch tells us that Nero himself used the rostrum to proclaim the "freedom" (tax exemption) of the Greeks. "The city of Corinth has twice now been the scene of the same benefaction to the Greeks; for it was in Corinth that Titus at this time, and at Corinth that Nero again in our own times — in both cases at the Isthmian games — made the Greeks free and self-governing, Titus by voice of herald, but Nero in a public address which he delivered in person, on a tribunal in the market-place amidst the multitude." – Plutarch, The Life of Titus Flamininus, 12. The rostrum was not a court and the "trial" here of an obscure Jewish preacher before the governor of all Greece is ridiculous. On the west side of the forum is the city council chamber (Bouleuterion), in front of which is the rostrum or "bema" – the platform for official proclamations. Did an obscure wandering rabbi called Paul really get a hearing here before the "prime minister" of all Greece? Fat chance. The Gallio Inscription is evidence of Gallio in Delphi but it is not evidence of Paul in Corinth. In any event, purely local matters would not have concerned the proconsul of Rome who seems to have had his residence across the gulf at Delphi. He didn't like Corinth (Seneca, Epistulae Morales 104). In the Christian fable the supposed superstar pioneers of the faith are routinely aggrandized by encounters with the high and mighty. Gallio was the brother of Seneca, Nero's tutor and chief minister. The fictional encounter in Corinth opened the door to a more audacious later fabrication, letters between Paul and Seneca himself! "But when Paul was about to open his mouth, Gallio said unto the Jews, If indeed it were a matter of wrong or of wicked villainy, O ye Jews, reason would that I should bear with you: but if they are questions about words and names and your own law, look to it yourselves; I am not minded to be a judge of these matters. And he drove them from the judgment seat." "Luke places in Gallio's mouth the judgment which he would like other magistrates to pronounce over his own contemporaries." – Wilson, Paul - Mind of the Apostle, p179. "Gaius, whose hospitality I and the whole church here enjoy, sends you his greetings. Erastus, who is the city's director of public works, and our brother Quartus send you their greetings." The notion that the Corinthian church had members of high status has always appealed to a certain class of Christian, the well-heeled variety uncomfortable with the thought that Christianity began as a slave religion. It is therefore with some delight that Paul's acolytes in Corinth have been identified as drawn from the "more respectable" classes. 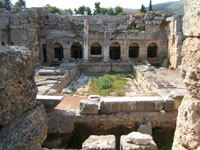 In 1929 an inscribed marble paving stone was discovered in the northeast corner of the theatre in Corinth. Dated to the second half of the first century, the inscription (originally inlaid with metal) read: ERASTVS PRO AED S P STRAVIT. This is an abbreviation of ERASTUS PRO AEDILITATE SUA PECUNIA STRAVIT and translates as "Erastus in return for his aedileship laid at his own expense." For those already committed to faith here was proof from archaeology of the claims of the New Testament. In the so-called letter to the Romans – presumed to have been written in Corinth – Paul sent greetings from an Erastus, treasurer or director of public works for the city. Yippee! And there's more. 2 Timothy claims Paul wrote "Erastus stayed in Corinth, and I left Trophimus sick in Miletus." (4.20). And the book of Acts tells us Paul "sent two of his helpers, Timothy and Erastus, to Macedonia, while he stayed in the province of Asia a little longer." – Acts 19.22. Closely examined this "evidence" quickly evaporates. Is it likely that the aedile named Erastus on the paving slab really was the same person named Erastus and identified as an oikonomos in Romans? The Greek oikonomos is equivalent to the lesser office of arcarius – a treasury official. Under Augustus the office of aedile had lost much of its importance, but it was still an important step on the cursus honorum to high political office. An aedile was a senior ranking public official, superior to the quaestor but subordinate to praetor. The next promotion for a praetor was consul of Rome. Could Paul really have sent a member of the Roman ruling elite, the treasurer of the capital city of Greece no less, on an errand to Macedonia as claimed by Acts? The idea is palpably ridiculous. Given that the name Erastus is not particularly unusual what we have here is the chance survival of an inscription which happens to use a New Testament name. The less than reliable 2 Timothy, one of the "pastoral" epistles is widely acknowledged to be a late 2nd century creation of the Church. "The Aricians tell a tale that agrees with the inscription on this slab, that when Hippolytus was killed, owing to the curses of Theseus, Asclepius raised him from the dead. On coming to life again he refused to forgive his father rejecting his prayers, he went to the Aricians in Italy. There he became king and devoted a precinct to Artemis, where down to my time the prize for the victor in single combat was the priesthood of the goddess. The contest was open to no freeman, but only to slaves who had run away from their masters." – Pausanius, Periegesis Hellados, 2.27.4. Not all of Corinth was destroyed by Mummius in 146 BC. The temple of Apollo was spared, as were the sanctuaries of Demeter and Kore south of the city and a sanctuary of the healing god Asclepius to the north. Before being usurped by Christ, Asclepius was one of the most popular deities of the ancient Mediterranean. Sanctuaries of the god are found across the Greco-Roman world, even including the city of Jerusalem. Asclepia offered a range of holistic treatments including massage, herbal infusions, dream interpretation and bathing. In Corinth the cult centre had an associated gymnasium, dining/rest rooms for the infirm and several reservoirs which fed the healing waters of the Fountain of Lerna. In the ruins of the small temple and its once colonnaded courtyard hundreds of life size terra-cotta body parts, votive offerings to the god, and a stone collection box have been recovered. Interestingly, in the precinct of the Asklepieion the earliest Christian funerary stelae in Corinth have also been found. Did the first Christians conflate Asclepius with their Christ? In the 4th century, after an existence of nearly a thousand years, the sanctuary of Asclepius was closed by the Christian emperors. The population of the city – no doubt less healthy than it had once been – began to fall. By the 6th century plague victims were being buried in the abandoned reservoirs.